So for my little bit of morning movement, I walk to the train MWF, do sun salutations TuSa, bike to therapy Thursday, and that leaves Sunday. I had originally planned sun salutations TuSaSu, but they actually made me sore! And if I've learned one thing this summer it's that if I don't respect my body, undermind is going to send me to the cornfield. I could have done sun salutations 3x/week if Thursday had been available, the spacing would have been better. Two days in a row though, not so much. 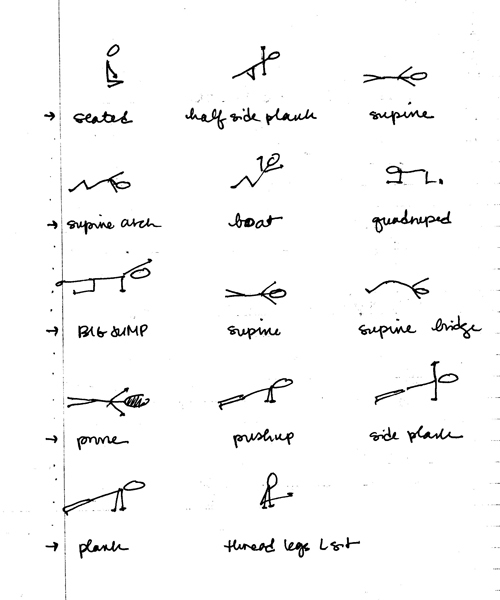 The idea then was to add days when I got stronger at sun salutations, which I have already. I think sun salutation adherents say that you should do sun salutations every day—what's with everybody wanting to do everything every day, sheesh. There are other factors: first of all, there's what organically works for the day, like walking works for walking to the train to work and biking works for biking to therapy. My pattern-loving brain wanted to bike on Sunday (walk three, yoga two, bike two), but really what organically works for Sunday is something I can do in the kitchen. Which brings us back to sun salutations, and I'm strong enough, sooo... let's go? But secondly, there's keeping it fresh: if I only do sun salutations on Tuesday and Saturday, it changes in my mind from "I have to do sun salutations" to "I get to do sun salutations." Not only can I keep it like that for sun salutations, I can have it like that for something else that I only do on Sunday. So what to do on Sunday. In the kitchen. If you're starting to worry about me, I am not insane. I'm not thinking that I'm going to take up ballet at the age of 48, having studied dance in my life never, and match the performance of a principal dancer with the British Royal Ballet. Even if I practiced more than once a week! No no, I am a student of small things. I was thinking it might be nice to sit like he's sitting in the first seconds and just drool at this beautiful thing, I can think of worse Sundays than that. And hilariously, I could not even do that. I don't have that range of motion in my ankle yet, because of the sprain. I literally could not just sit. It wouldn't take my body weight, not even for one second. Which meant, I had something to work on. But I only get to do it on Sundays! That was last week. Supine thoracic arch to sit cross-legged (not boat)—this is SO. HARD. Except for the crazy big jump in the middle, these are all familiar, doable movements, worth doing in themselves. Ten reps each of each of these, just saying, that's a workout. I'm going to need a bigger kitchen. It's going to take thirty years for me to string together the first 47 seconds of this video. By which time I will be ninety, which will be remarkable in of itself.